Crafts and clothes, art and accessories, today’s gift guide focuses on ten bright and fabulous gift ideas for kids. 1. Louis the Lion Hooded Sweatshirt by Olive and Moss, £32.00. 2. 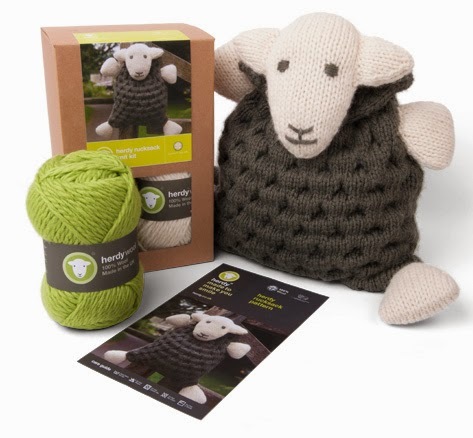 ‘Make Your Own Herdy’ Rucksack Knit Kit by Herdy, £38.00. 3. Rudolph Gift Set by Inch Blue, £32.00. 4. My Toys Embroidered Print by Natasha McCormick, £55.00. 5. Animal Carry Cases by Posh Totty Designs, £6.50. 7. Alphabet Print by Rosie Wonders, £125.00. 8. Highland Cow ‘You Wear It Well’ Gift Set by Scamp Baby Gifts, £26.00. 9. Coco Cow Slippers by Sew Heart Felt, £24.95. 10. Little Loopy Lapin Toy by The Black Rabbit, £27.50.